I don't believe that there is any cause for alarm. I turn mine off each night to charge my phone. I also have a charger in the office where it charges when not in the holster. I also have a car charger to charge whenever I am in the car. The I have done this with all my smartphones. mssca, GSDer, coolio100 and 1 others like this. Most modern battery charging does not continue charging when the battery is full. I assume that is the case with the S3. My evidence is that when I unplug my phone from the charger in the morning, it usually drops immediately to 98 or 99%, which is where I assume it stopped charging. I have seen the same thing. After checking email in the morning I will put it back on the charger while taking a shower. When I pull it back off the battery will show 100% for a longer time and last a bit longer. From my understanding, what happens is that once the battery hits 100% the charger begins to cycle off and on usually with a range of 2%+/-. This explains what we are seeing. After using the phone for a few minutes, topping it off to 100% helps give it a little extra boost. No worries, OP with charging. Plug it in and let it go. You can't over charge the phone. Are you spamming us and selling this. The phone prevents over charging. This would be annoying. you cannot over charge this phone!!! So far, i have not heard anybody actually representing any cell phone companys. We have not heard of anybody representing any battery companies at all. Cellphones are *NOT* smart chargers. It's not the charger that's smart, it's the phone which regulates the charge. If the battery were getting overcharged, it would get very hot just sitting there once the charger hits 100%. Have you noticed that happening? But if it makes you feel better, there's certainly no harm in unplugging the phone when it reaches 100%. 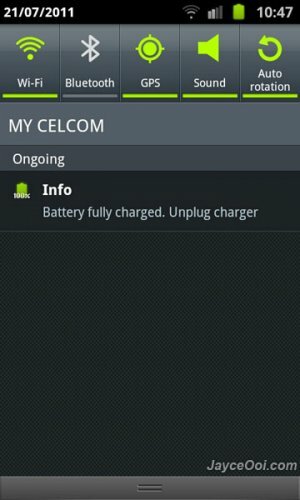 Why does the S3 say this "Battery fully charged, unplug charger"? My old iPhone never seemed to have problems if I left it plugged in. Since I've had this Android S3 for 2 month the battery life has dwindled to <5 hours. Which is ridiculous. The phone gets hot which indicates that the phone is using a lot of juice. Is this normal. What battery life is normal for a S3?